Fajr is an iranian small, experimental satellite. Reportedly it features a cold gas propulsion system to circularize its orbit. 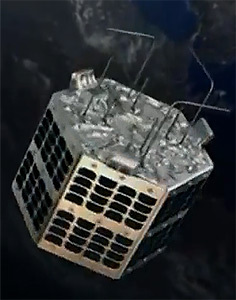 The satellite body is a 6-sided prism with a height of 49 cm and a width of 35 cm. The launch weight is 52 kg. The launch took apparently place on 23th May 2012 or around that date but failed and was not reported in the media. Satellite images taken before and after that date showed, that a rocket launch took place from the launch pad. The pad was clean on 18th May, but imagery from 21th June indicates that a launch took place between those dates. As a launch of a Fajr satellite was still announced to be planned several month after this event, it is likely, that a second back-up has been built. After a second Safir launch failure between 22.09.2012 and 25.10.2012, it is possible, that the second Fajr has also been lost. On 2 February 2015, the successful launch of Fajr into orbit has been announced. It was launched into an elliptic 224 km × 470 km orbit with an inclination of 55.53°. It reentered on 26 February after 23.8 days in orbit. Apparently it performed no maneuvers during its orbital lifetime.